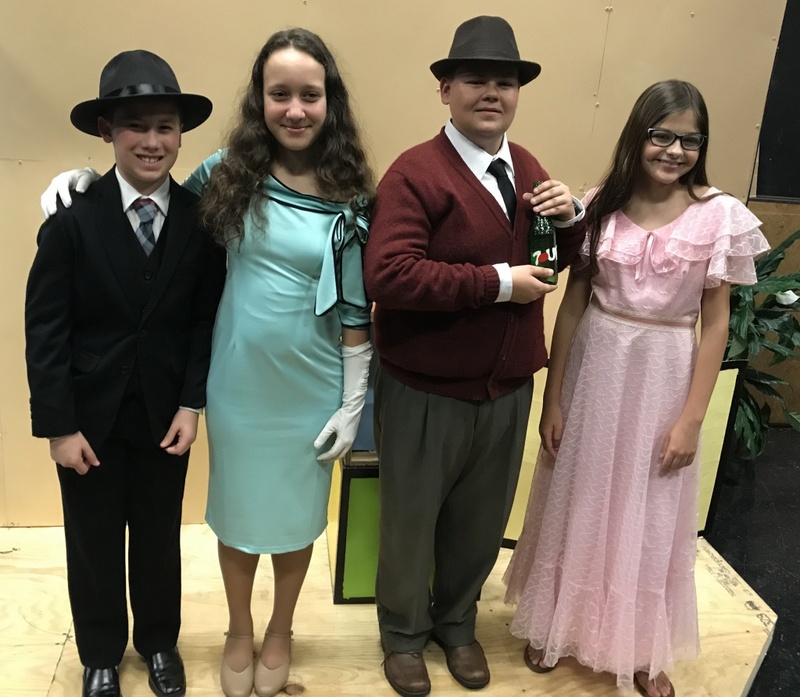 After almost a year of preparation by the director, students, cast and crew, the production “Bye Bye Birdie” took musical theater at Boca Raton Middle School to new heights. With a talented cast, amazing sets, fun and period costumes, this campy musical hit a chord with audiences all three performances. One word: WOW! The audience was stunned to see the major part of the stage set turn into a turn table worthy of Almalou’s record player where actors and props were setup all night behind the scenes and would appear complete and ready to go with actors standing at the ready. Affectionately called the “Milkshake” by director Joshua Tay and cast and crew, it was brilliantly used through the production and was clearly constructed amazingly well and sturdy. There were giant flats skillfully colored to match the musical that created an ambiance never before scene at the Joshua Tay Theater and like it’s namesake (in fact it is the man himself), it was simple yet visually stunning transforming an ordinary stage into visual delight. Hats off to Tay, the stage crew, and to many of the parent volunteers who put this stuff together from scratch! There is one thing that some productions need when it comes to wardrobe: that no one notices it. Why? Because in a period production where people are mostly wearing common clothes, wardrobe should not be noticed. It should give you and overall look that simply says in this case: late 1950s. And that it did to a tee by costumer Veronica Villegas-Fondeur. From the mink stole worn by Mae Peterson, to the sultry red dress of the spanish rose, to the flashing costume of Conrad Birdie on the Ed Sullivan show, the wardrobe was amazingly effective and was background when it was supposed to be, and foreground when it needed to be. Conrad’s wardrobe stole the show from gold-jacketed Elvis Presley gaudy to the campy “cross-dressing” Conrad trying to hide in women’s clothing. From the groupies 50s dresses and skirts to the principle characters, I give the wardrobe a big big thumbs up for being spot on. (See the graphic header for this article and see how the clothes fit the part so well). The principle cast was carefully crafted by director Joshua Tay who had a lot of talent to work with this year. Albert Peterson, the principle male lead, played by 8th grader Eryk Dewire, emanated the hardworking, emotional, loving person, and often complex character of a man who teetered on the brink of disaster both in his personal and professional life. But with Dewire’s skillful performance, you had no choice but to love this guy. Eryk’s love of acting, kind demeanor, and even kinder voice came through in a brilliant performance that included a memorable rendition of the famous song “Put on a Happy Face” which included a jump high “click your heels” dance move that would make even the best director nervous. But Eric pulled this off for the entire performance with fun abandon, great singing, and talented acting. As I said before, it is impossible not to like this guy as a character and as an actor. Sophia Vega, Antonio Saldino, and Eryk Dewire as Rose, Conrad, and Albert. The principle female part of Rose Alverez, played by 8th grader Sofia Vega, and on Saturday by understudy 7th grader Victoria Fondeur, was type cast to perfection by Tay and the talent and the actresses hard work shined through the character. Rose, a woman conflicted between leaving or staying with a kind, dreamy, yet at times “immature” boy-man requires a strong voice, great acting, and even better dancing to make the couple work. The large dialog, numerous songs, and intricate dance routines was evident throughout the night for both actresses and with one scene in particular. The famous “Spanish Rose” song and dance requires incredible stamina and poise and both actresses nailed their performances. Vega brought out the latin side of the character with all the naturalness of a true veteran actress with her last performance on Friday night taking “Spanish Rose” to new levels. With an intensity at an all time high, Vega left the stage on Friday to venture out into the audience to engage them up close and personal. This writer has not seen many “give-it-your-all” performances like this for many years and Vega blew it out of the house. Fondeur, who played Rose on Saturday, brought a more “calm and confident” Rose who seamlessly entered the role without the cast missing a beat. She too shined on Spanish Rose bringing her own flair and talent to a very difficult role which was worthy of the principle role. Watch for Fondeur next year to shine even more! Conrad Birdie was skillfully played by 6th grader Antonio Saldino who took on a role worthy of Elvis Presley himself. It was hard to believe that he is only in sixth grade yet he crooned like a veteran, acting a part that few could pull off. His sultry voice and dangerous attitude was tempered at times with passages of vulnerability as exhibited by his flirting scenes with luckly (or unlucky) Kim MacAfee, dancing and singing sequences which there were many, and gyrations that coaxed his ensemble of girls into shrieks of joy. His cross-dressing scene revealed the skilled actor he truly is when he is mistaken for Rose several times in one of the final scenes doing a skillful female voice shift while still letting through his body language of masculinity. A powerhouse of acting and singing talent with Alejandro Quinones, Luanda de Hilster, Christopher Little, and Julia Gonzalez as the MacAfee Family. 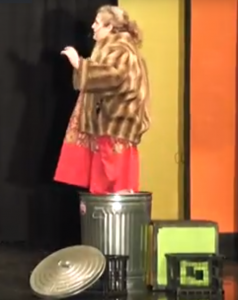 Kim MacAfee, played by Julia Gonzalez, showed off an experienced 6th grader with an amazing soprano voice. In fact, during one of the group choral scenes, Gonzalez hits a high note at the end of the music that would have shattered wine glasses if they were present. But her acting and singing skills came blasting through during her song “It’s Lovely to be a Woman” where she gets dressed while singing and acting. This scene was an amazing exercise in absolute talent for someone so young with Gonzalez putting on socks which standing on one leg, and pulling a big sweatshirt over her head which singing with a head microphone while never missing a beat or one note. Hard to believe this actress is only in the 6th Grade. Doris MacAfee was played by 7th grader Luanda de Hilster who blew the house down in last year’s production of “Seussical the Musical” with her 6th grade acting and voice performance debut as the Sour Kangaroo. With a voice and acting ability compared by some to some famous singers and actresses, de Hilster turned a minor role into a major treat. Playing beside Harry MacAfee played by Christopher Little, the duo put on what I consider to be “the” acting performance of the production. De Hilster’s “in-character” acting and voice expressions was a sleeper performance and those of us who know her talent, saw her take a more minor role to a major level. In fact, the powerhouse trio of de Hilster, Little, and Gonzalez was the strongest acting trio of the entire production blowing through the mics each night with their rendition of the church-like hymn “Ed Sullivan”. De Hilster also showed us her dancing abilities by following the choreography side-by-side with Little with such skill that it looked like a typical housewife who doesn’t get “too showy” yet delighted secretly in her own world as not to overshadow her “Archie Bunker-like” husband. I look forward to seeing her as an 8th grader next year in a major way and I expect to be amazed! But who stole all three nights in this writer’s opinion, even forming groupies from crowds familiar with the actor on stage, was Christopher Little who played the lovable yet abused character Harry MacAfee. Teamed up with acting and voice dynamo Luanda de Hilster and Julia Gonzalez, Christopher’s role popped out of the musical like a fist in your face that stole the show. His intensity and timing was impeccable, with pauses that sometimes were more powerful than his dialog and acting. Constantly enraged, belting our commands, and singing like a veteran, Little made the perfect transition from hating his life to becoming starstruck by his fortuitous appearance on the Ed Sullivan show where he constantly interrupted Conrad Birdie’s performance with his waving to the camera. His voice expression was on the money and his rant about the Conrad groupies outside his window blew the roof off the theater with one of the biggest audience reactions each of the three nights. This guy is a star and you can tell he loves the role and acting. Both the audience and I see a bright future for Little and musical theater! There were some “sleeper” surprise performances I found in this year’s production to be simply delightful as did the audience. Alessandra Coke who played Mae Peterson was one of the revelations of the production. Mae Peterson played by Alessandra Coke, got great laughs during the entire night with stunts like her standing inside a trash can, laying down in front of a train to die, and even trying to seduce Conrad Birdie with a sultry leg. Her singing solo as well as her acting included great timing, great body movement, all the while keeping the audience entertained with an unexpected jewel of a performance in the musical. Everyone could see that Coke was a naturally shy actress who used that to play the role extremely well which only endeared her more to the audience who saw a great performance by a talented and upcoming actress. Congrats to Tay for casting this role. The second sleeper performance was by Tazmin Bradley who played the fun yet quirky character Hugo Peabody. Short in stature, this dynamite actor made up for his physical size with campy acting, skillful voice changes, and a drunk worthy of the “best drunks in show business”. He got the biggest crowd reaction all three nights when he comes in and roundhouses Conrad Birdie during the live performance of Ed Sullivan show. Other actors of note were Ursula Merkle played by Halina Goldstein who has a booming voice, and clear acting skills that stood out. The teenagers played by Anushka Scudder, Lilya de Souza, Sophia Mills, Maia Martinez, and Elyse Potash also stood out whose scenes included a lot of dancing, singing, and acting as well as the famed “telephone hour” scene which they sang beautifully. 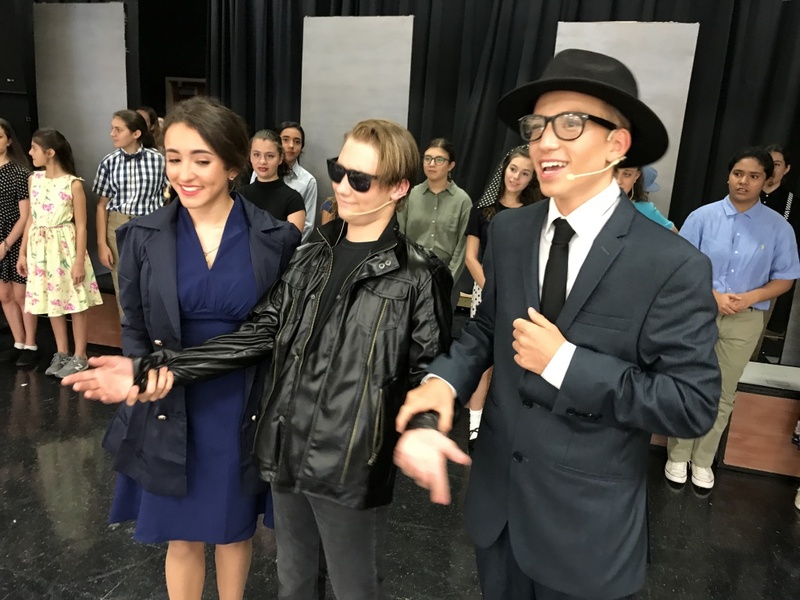 The ensemble group really added a lot to Boca Middle’s Drama productions with there never being a problem with creating believable crowds of shear presence on the stage. These actors gave it their all and they certainly enjoyed singing and dancing and added the all import “choral” voices needed in any believable musical production. And this one called for it in spades! There are so many to name here but rest assured, they all greatly contributed to the entire production and without them, it couldn’t have happened as well as it did. The crew was truly amazing. The scenery was nothing light and movements were choreographed like a ballet and when off without a hitch. I can’t imagine the hours put in by the crew to get the scene changes correct during the complicated yet beautiful scenery and sets. And all of us in theater know that the crew are always the star principle in any production. BRAVO! Director Joshua Tay standing in front of the stage that now bears his name. Bye Bye Birdie’s production level is worthy of most high school musicals, let alone a top-rated middle school like BRCMS. Tay’s masterful artistic direction was evident throughout the night with amazing scenery, a skillful interpretation of a complicated script, and memorable choreography including a smash rendition of “Put on a Happy Face” – all the while he tickled the irovies with the skill of an accomplished pianist. The affection his students have for him is only bested by this affection and skill as a musical masterworker and may explain his is almost “cult-like” and super celebrity status he has among his student cast and crew. With the stage now permanently bearing his name (See the article and video of the stage dedication here), I, like many am sorry to see him go. 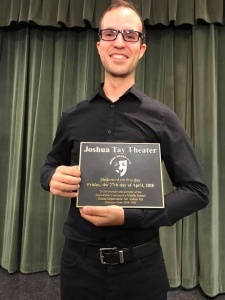 But I’m sure Joshua’s amazing artistic skills for the theater will find a new and amazing home in the near future. But most important, as he said in his speech after the stage dedication, this production will not stop. The new director who arrives this summer comes directly from the Broadway district in New York City and is sure to take this group to new levels. I am extremely certain that Joshua would find a replacement he considers even better than himself. Even though that is hard to imagine! Bravo Boca Raton Middle School Drama club!